Open Resource Hacker utility. Click on File ---> Open. 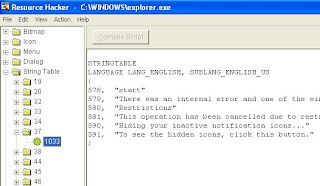 Type "explorer.exe" in the text box. Step 4:From the right window next to where start is written in front of 578 edit the text to what you want on your start button. Step 7: Restart your computer to see the changes.